Click through the pictures above - do you recognise ANY of the scenes shown? These chilling pictures show how seven Birmingham webcams have been hijacked and broadcast online. Can you help alert the owners? Some of the pictures show hackers using baby monitors to snoop on local children in their beds. In one sinister image published on a Russian website, a city youngster can be clearly seen asleep in bed. A second picture taken some time afterwards shows an empty bedroom, with pink blankets tossed aside. Others pictures of the bedroom taken in the daytime have also been published. Yet the child's parents have no idea their baby monitor had been hacked into by sinister snoopers and the footage then broadcast online, thousands of miles away. And a Mail investigation has discovered more shocking images from other Birmingham homes which show how easily hackers are invading privacy. One of the pictures reveals a living room with a pet dog snoozing in a cage. Others show back garden lawns and driveways with parked cars. All the images were tagged 'Birmingham' and broadcast on a Russian-based hacking website - which claims to be highlighting security concerns. But the Information Commissioner's Office (ICO) has demanded the site is closed down and has urged the public to change default passwords on cameras which can be remotely accessed online. The type of cameras targeted are used by householders who want to monitor their properties while at work or on holiday, or by parents looking to keep a watchful eye on their sleeping children. Hackers use special software programmes to link into the feeds and then upload live footage to the internet for anyone to view. The Russian-based website, seen by the Birmingham Mail, claims it was launched to highlight the importance of security settings. The website, which went live a month ago, reads: "This site now contains access only to cameras without a password and it is fully legal. 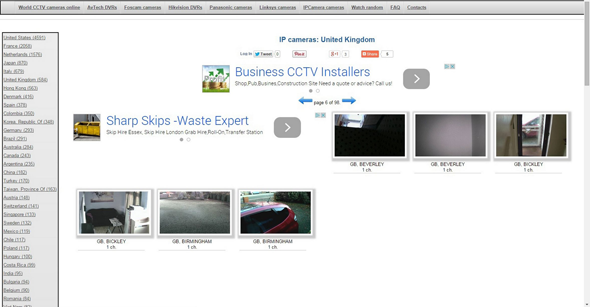 Such online cameras are available for all internet users. 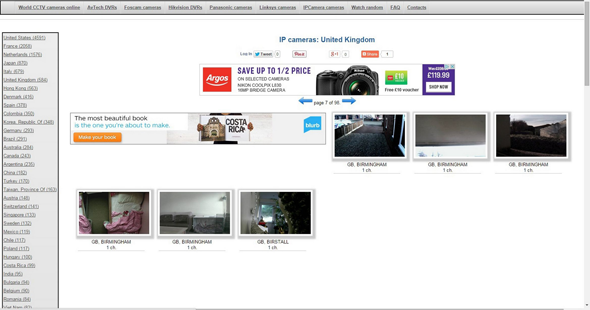 To browse cameras just select the country or camera type. "This site has been designed in order to show the importance of the security settings. To remove your public camera from this site and make it private the only thing you need to do is to change your camera default password." The website lists live feeds from more than 250 countries and has nearly 600 different streams listed for the UK alone. Details of the city and country the hacked camera is in, along with the model of the hacked device, are listed underneath each stream. The UK information commissioner Christopher Graham has said he is investigating how to have the website shut down. He said: “I’m very concerned about what this [website] shows and I want the Russians to take this down straight away. "We now want to take very prompt action working with the Federal Trade Commission in the States to get this thing closed down. But the more important thing is to get the message out to consumers to take those security measures. If you don't need remote access to a webcam then switch off that function altogether. "We have got to grow up about this sort of thing. "These devices are very handy if you want to have remote access to make sure your child is OK, or the shop is alright, but everyone else can access that too unless you set a strong password. He added: "This isn't just the boring old information commissioner saying 'set a password'. This story is an illustration of what happens if you don't do that. If you value your privacy, put in the basic security arrangements. It's not difficult." Simon Rice, ICO group manager for technology, said: "The website, which is based in Russia, accesses the information by using the default login credentials, which are freely available online, for thousands of cameras. "The footage is being collected from security cameras used by businesses and members of the public, ranging from CCTV networks used to keep large premises secure, down to built-in cameras on baby monitors. "This is a threat that all of us need to be aware of and be taking action to protect against."